Last week Apple “officially” introduced Apple Music to the public with the release of iOS 8.4. 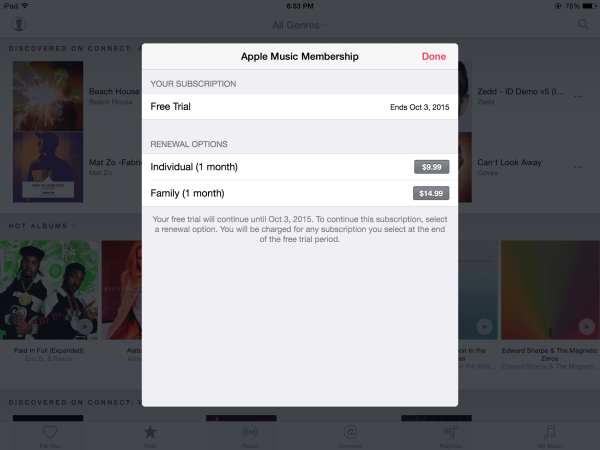 If/when you decide to activate the streaming music service on your iPad you will be able to use it for absolutely free for the next 3 months. Thomas recently posted his thoughts on Apple Music–and by the title of his article, I’d say he’s rather happy with it thus far. For some reason I’ve never really been a big fan of streaming music. However, with nothing to lose but the opportunity to try the service for free, this seemed like the perfect opportunity to test the waters across all my iOS devices. After the free-trial period has ended, you will have two membership options available for continuing your streaming service. The first offering is a single user account that will cost $9.99/month. The second option is a Family plan that can accommodate up to six members and costs a surprising $14.99. Both versions will grant you access to the full Apple Music library, along with recommendations, and unlimited skips on each of the radio stations. 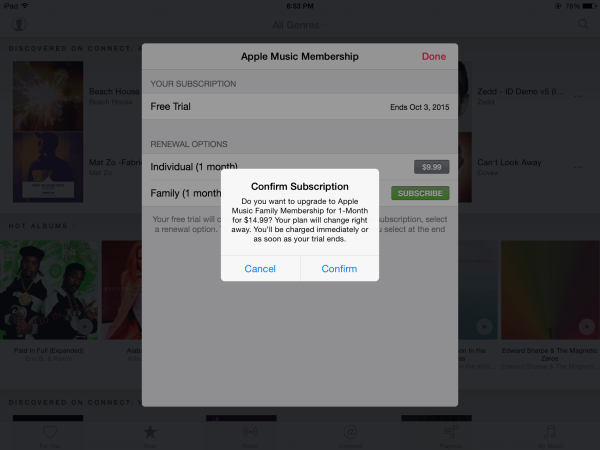 If you select a renewal option at this time or any other time before your Free Trial expires the saved credit card information from your Apple ID will be charged every month thereafter.